Here is a preliminary list of websites that have joined our campaign. To be included in the list below you just need to insert one of our "We Support Real Stereo" logos into your website and link it back to our website, possibly to our Real Stereo page. Then send an e-mail to direttore@tnt-audio.com so that we can add your website to the list below. A simple e-mail with "Real Stereo" as subject, the URL and a short description (title, category and country of origin) of your website in the body of the message will suffice. 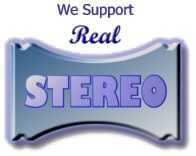 You don't need to manage an audio/hifi related website, every website can support our campaign. Indeed, some of the websites listed below aren't expressely devoted to audio. Joining the Real Stereo campaign is FREE of charge, of course!